If there is one specific that separates Kirk Franklin from the rest of the gospel pack, it is about crafting the perfect theater scenario for his mini motivational platform. There is almost no way anyone who has followed Franklin’s magnetic career would deny that his musical passion and production fully accent the intended messages. Yet, it is the personal turmoils that drive everything in his bones, resulting in multiple Dove, Stellar and Grammy awards, several platinum CD’s since 1993 and top-ten gospel and top-100 R&B hits. In the long run, though, do all those accolades and credentials really sustain the joy in Franklin’s multi-tasking heart when all is recorded and done? 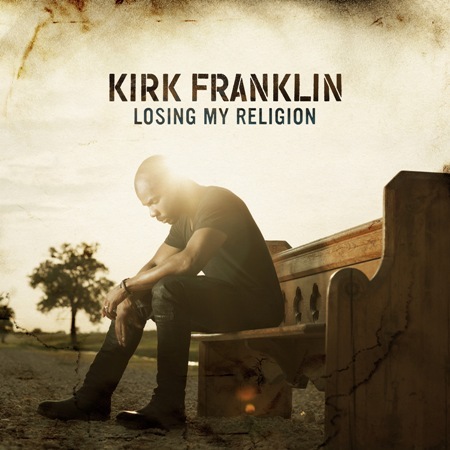 Evidently, according to the premise of his first studio project in four years, Losing My Religion, there is still more weighing on Franklin’s mind in terms of conveying the gospel amidst today’s culture. In his own fresh musical fashion with a few twists and turns along the way, Franklin and his supporting cast generate another series of full-out theatre vignettes about addressing the difference between relationship and religion. Of course, there are plenty of trademark Kirk productions in the mix throughout Losing My Religion. “123 Victory” is a head-nodding groove lead by Franklin’s relentless praise about God’s abounding grace. Franklin, Tasha Page-Lockhart and Zacardi Cortez transform “It’s Time” into an unapologetic testimony service with brass and mass choir: “All things are working together for your good.” “The truth can hurt or the truth can change you” is the burning issue on the debut single, “Wanna Be Happy,” with the chorus echoing the Al Green smash hit, “I’m So Tired of Being Alone.” While the beats are quite appealing, “No Sleep Tonight” delivers a sound message teaching the validness of how Christ’s love leads to true compassion. One guarantee is that Franklin completely trusts the supporting vocalist’s strongest gifts. Former ‘Family’ member Tamela Mann, Tasha Cobbs and Sarah Reeves pilot “My World Needs You,” where the sweet aroma of worship fills the air throughout. Yet it is the exceptional jazz vocals and pacing of Kim Burrell and Lalah Hathaway on “When,” that provide the biggest highlight on Losing my Religion illustrating the anticipation of heading to that heavenly mansion. Although Kirk’s production and arrangement intuition usually clicks, “Over” is the only serious misstep, falling into an auto-tune trap with a lack of vocal substance. While these Kirk-isms dominate Losing My Religion, there are some surprisingly bold steps outside the box. Franklin’s vulnerable lead and an all-male choir effectively conveys the importance of prayer in “Pray for Me”: “I’m afraid I’m about to lose it all…Cause judging me is not helping me to grow.” On the other extreme, Franklin spits a socially conscious, spiritually on point spoken word in the title track that covers all the concerns about leaning more towards a relationship instead of the dangers that religion stresses. The loyal fans will certainly gravitate to Losing My Religion for Franklin’s brand of gospel music theater. However, it is the meat of the messages that provide some valid teaching moments between the difference of religion and relationships. Four and a half stars out of Five.